Few gold coins circulated freely in the United States during the earliest decades of the 19th century. During much of this time, the bullion content of every U.S. gold coin exceeded its face value, if exchanged for silver on the world market. This led to enormous melting losses. Congress sought to eliminate the profit margin of the bullion speculators by reducing the gold weight in U.S. coinage by about 6.3%. To reflect the new standard, the Classic Head type was released in August 1834, produced in quarter eagle ($2.50) and half eagle ($5) denominations. With the incentive to export and melt removed, for the first time U.S. gold became a sustainable force in everyday commerce. 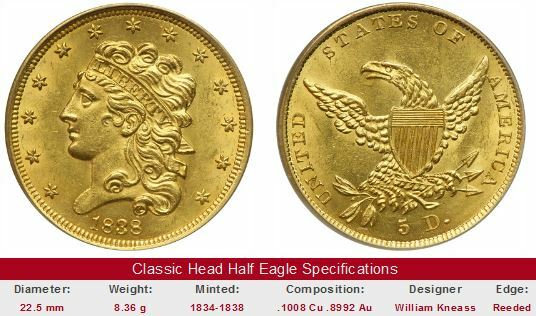 The Classic Head U.S. five dollar gold coin was minted only from 1834-1838, but during this time, almost the exact same number of half eagles were coined as the Early Half Eagles of 1795 to 1834. Mint Engraver William Kneass depicted a somewhat masculine Liberty facing left. Her thick, curly hair was kept under wraps by a LIBERTY headband. The reverse was essentially a continuation of the John Reich eagle design from 1807. Kneass and his successor, Christian Gobrecht, continuously dabbled with the design throughout the short run of the Classic Head type, creating at least a dozen varieties to collect of gold half eagle coins. 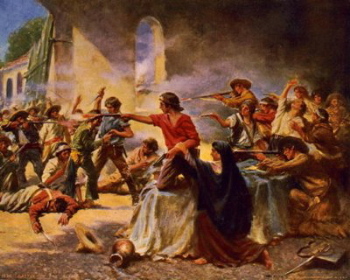 In 1836, nearly 190 Texans fought the Mexican Army from inside an old mission chapel in San Antonio called the Alamo. The Texans were fighting for independence from Mexico. Colonel James Bowie and Colonel William B. Travis commanded the Alamo garrison, including famed backwoodsman Davy Crockett. The Mexicans, led by General Antonio López de Santa Anna, were determined to capture the Alamo. On March 6, 1836, the Mexicans launched their final assault, ending the 13-day standoff. An estimated 1500 Mexican soldiers died in the siege. There were no Texan survivors, though a small number of non-combatants were spared. On April 21, 1836, Sam Houston, commander of the Texas Army, led a surprise attack on Santa Anna's men. Shouting, "Remember the Alamo!" the Texans won the battle at San Jacinto in 18 minutes and secured Texas independence from Mexico. The last of the Classic Head Half Eagles was released in 1838. The following year, Gobrecht’s Coronet Head $5 gold coin took over and remained in production until 1907. Because the Classic Head was nearly identical in diameter and weight to its replacement, it saw heavy duty circulation for many years. Consequently, relatively few mint state examples exist today. Classic Head type production, though brief, played an important transitional role in the evolution of United States coinage. The inability to retain gold coinage in circulation was both a hindrance to economic activity at home and a blow to national pride abroad. The issuance of the Classic Head type resolved longstanding hard currency challenges while bringing the United States one step closer its Old World competitors. It is smart idea to buy key date Classic Head Half Eagles that have been certified by one of the four most reputable grading service companies: PCGS, NGC, ICG, or ANACS. At the very least, make sure the seller is well spoken of in numismatic circles. Swindlers take advantage of collector eagerness to own Charlotte and Dahlonega gold coinage, and will seize the opportunity to sell overgraded or fake material to inexperienced buyers. The links below take you to eBay US coin auctions featuring key date Classic Head Half Eagles. The left hand side of each "Sales Box" depicts value trends over a very long period of time for the indicated key date in F-12 condition. The percent annual increase since 1950 is computed to facilitate comparisons. The right side of the box is a link to eBay US coin auctions that is coded to isolate the Classic Head key dates for sale right now. Keep in mind that even on eBay, where many thousands of coins are for sale all the time, there is good possibility the key date "For Sale" search will come up empty. The dates below are rare, but not ultra rare, so if you keep checking back, you'll eventually get a chance to own a Classic Head Half Eagle key. One other thing: The coin pictured for sale, if any, is not necessarily the same condition coin as that represented in the value trend analysis on left hand side.